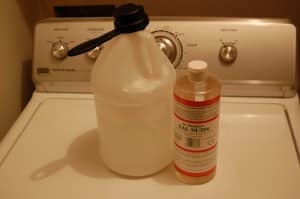 Today I am going to share with you my very first experiment with “green cleaning.” When choosing between cheap and green, I always choose cheap first. Doing things naturally is pretty hip right now and I like learning about and participating where I can, at the same time though, I can’t let it eat into my dollar. Happily, this recipe meshes cheap and natural together quite nicely. Today’s experiment: Homemade Laundry Detergent. My husband doesn’t mind my forays into experimenting as long as the end result is effective. Thus, we buy middle of the road dishwasher liquid (not the fancypants brand, but not the cheapo depot either). I made my own dishwasher liquid for a couple months, but it did not cut the mustard, and eventually got nixed. This laundry detergent, I can tell you from personal experience, works. I’ve been using it for about six months to clean everything from collared dress shirts to dirty cloth diapers. Grab yourself a one gallon container. I use an old one gallon vinegar container (yes, we love our vinegar). Mix the hot water, salt, and baking soda together. This helps the salt and baking soda dissolve. The salt will prevent your colors from bleeding. The baking soda will deodorize your clothing as well as brighten your colors and whiten your whites. Pour this mixture into your gallon container. Add the liquid castile soap. This powerful soap is expensive, but lasts forever. I had used Dr. Bronner’s Sal Suds and bought it off on Amazon, finding it cheapest there. No matter what brand, make sure you are buying unscented. Scented have added essential oils that could break down the fiber in your clothing. Top off your container with extra water and give everything a nice shake. Use 1/4 cup or 1/2 cup to wash your laundry. I normally just use 1/4 cup for regular clothing loads and 1/2 cup for the dirtiest loads (like the cloth diapers). Folks, we go through a lot of laundry. On average I am doing about 12 loads a week. There are only three of us, but doing cloth diapers means I’m doing a load of dirty diapers every night. We use copious amounts of detergent. Our daughter also has problems with skin sensitivity, and this detergent doesn’t aggravate her eczema. Buying the liquid castile soap will seem like a big investment, but you are getting about 64 loads per cup. Just remember that and take the plunge into natural cleaning!